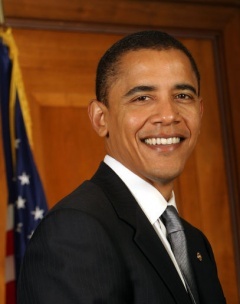 President Barack Obama's involvement with the Association of Community Organizations for Reform Now and its voter regestration arm, Project Vote and allied organization Demos. 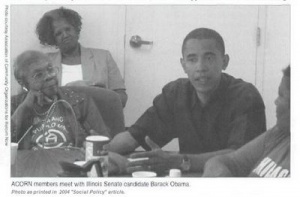 Obama's affiliation with the Association of Community Organizations for Reform Now, began in the early 1990s. In 1995, former Illinois Republican Governor Jim Edgar refused to implement the federal "Motor Voter" law, which Republicans argued could invite fraud and which some Republicans feared could swell the ranks of Democratic voters. The law mandated people be allowed to register to vote in government offices such as driver's license renewal centers. Obama sued on behalf of ACORN, the League of Women Voters and other public-interest groups joined in. "He and his client were the ones who filed the original case -- they blazed the trail," said Paul Mollica, who represented the League. Transcripts show that at court hearings, Obama identified himself, then let Mollica begin speaking. Maria Valdez of the Mexican-American Legal Defense and Education Fund sometimes spoke. The U.S. Justice Department joined in. Obama's side won, even without him talking. "Obama was involved to some extent in the legal work, but he was not the leader in actually litigating the thing -- Paul [Mollica] probably was the leader of the coalition and did most of the legal work," said David Melton, who represented Cook County Clerk David Orr. "Obama did have some expertise in certain constitutional aspects of the case." In the video below left, Deepak Bhargava opens the Heartland Democratic Presidential Forum December 10 2007 - a forum exclusively for thousands of "community organizers" including ACORN personnel. Obama promises to invite community organizers to the White House even before his inauguration, to contribute to setting his "agenda for change". Project Vote was and still is, the voter registration arm of ACORN. Article in Chicago Magazine January 1993, focused on Barack Obama's work with project vote and specualed he he might go on to higher things. The most effective minority voter registration drive in memory was the result of careful handiwork by Project Vote!, the local chapter of a not-for-profit national organization. "It was the most efficient campaign I have seen in my 20 years in politics," says Sam Burrell, alderman of the West Side's 29th Ward and a veteran of many registration drives. At the head of this effort was a little-known 31-year-old African-American lawyer, community organizer, and writer: Barack Obama...In 1984, after Columbia but before Harvard, Obama moved to Chicago. "I came because of Harold Washington," he says. "I wanted to do community organizing, and I couldn't think of a better city than one as energized and hopeful as Chicago was then." By 1991, when Obama, law degree in hand, returned to Chicago...black voter registration and turnout in the city were at their lowest points since record keeping began. Six months after he took the helm of Chicago's Project Vote!, those conditions had been reversed...Within a few months, Obama, a tall, affable workaholic, had recruited staff and volunteers from black churches, community groups, and politicians. He helped train 700 deputy registrars, out of a total of 11,000 citywide. And he began a saturation media campaign with the help of black-owned Brainstorm Communications...The group's slogan-"It's a Power Thing"-was ubiquitous in African-American neighborhoods. "It was overwhelming," says Joseph Gardner, a commissioner of the Metropolitan Water Reclamation District and the director of the steering committee for Project Vote! "The black community in this city had not been so energized and so single-minded since Harold died." As for Project Vote! itself, its operations in Chicago have officially closed down. Barack Obama has returned to work on his book, which he plans to complete this month..."We won't let the momentum die," he says. "I'll take personal responsibility for that. We plan to hold politicians' feet to the flames in 1993, to remind them that we can produce a bloc of voters large enough that it cannot be ignored." Obama shrugs off the possibility of running for office. "Who knows?" he says. "But probably not immediately." He smiles. Obama met Axelrod through one of Project Vote’s supporters, Bettylu Saltzman, whose father, Philip Klutznick, was a Chicago shopping-mall tycoon, a part owner of the Bulls, and a former Commerce Secretary in the Carter Administration. Saltzman, a soft-spoken activist who worked for Senators Adlai Stevenson III andPaul Simon, took a strong interest in Obama. Washington DC based "think tank" Demos was founded in 1999 by "social entrepeneur" Charles Halpern. Most of Halpern's recruits to Demos were well known politicians or activist such David Callahan, Rob Fersh, Stephen Heintz, Sara Horowitz, Arnie Miller, David Skaggs, Linda Tarr-Whelan. Why did Halpern recruit a then obscure State Senator from Illinois named Barack Obama to help him. By 1999, Halpern had assembled a talented working group to develop Demos. Among them were David Callahan, a fellow at the Century Foundation; Rob Fersh, a long-time policy advocate; Stephen Heintz, Vice-President of the East-West Institute; Sara Horowitz, founder of Working Today; Arnie Miller, a leading executive recruiter; Barack Obama, then a state senator from Illinois; David Skaggs, a congressman from Colorado; and Linda Tarr-Whelan, an internationally recognized expert on women and economic development. This working group would eventually form the core of Demos' staff and Board of Trustees. Obama became a Board member of Demos, as later did Obama's future "Green Jobs Czar" Van Jones. Demos is a partner organization of the far left Washington DC based 'think tank' Institute for Policy Studies. Demos has worked extremely closely with ACORN and its voter registration wing Project Vote on several projects. In 2008 Demos Fellow Lorraine Minnite served on the Project Vote board of directors. Demos President Miles Rapoport was one of ACORN's most ardent defenders when the organization was accused of widespread voter registration fraud during the 2008 election. This page was last modified on 23 September 2011, at 23:12.